Our 2019 NKD Holiday is a liberating fitness and yoga retreat in the sun. Have you ever wanted to go running on the beach naked? Or maybe you like the idea of a naked workout or a relaxed yoga session on the sand, with a dip into the sea when you need to cool down. With NKD Holidays you can do all that and more. You’ll be sharing the experience with a friendly group of like-minded guys and NKD hosts Paul & Stefan. This promises to be another amazing trip and you’ll be welcome whether you’re travelling on your own, with a friend or partner, or with a group of mates. We aim to make everything friendly and sociable, with group activities, parties and meals. All fitness levels are welcome and there will be plenty of choices of activity from beginners to advanced. 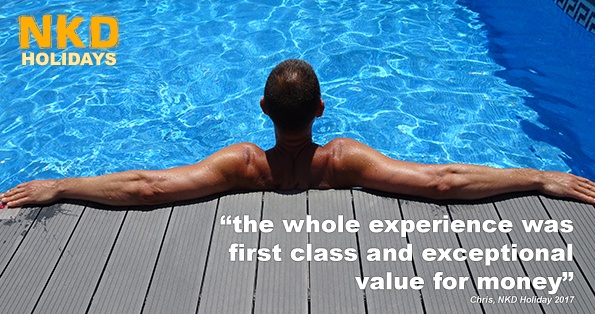 Maybe you just want to enjoy a relaxing holiday with great company; whatever your reasons you’ll be sure to get an experience you’ll never forget. There will be a wide range of Fitness and Yoga activities every day. We’ll be including walking, jogging, aerobics, circuit training, yoga, cardio and more. Other workshops and activities will also be on the agenda to keep you occupied, and there will be some more sensual sessions such as partner yoga. All activities will be optional, and there’ll be sessions available for all fitness levels. Activities will be at the resort, on the beach or in the famous Maspalomas Dunes. Clothing will be optional for all activities, except for walking/jogging to the beach or dunes; you will need to wear shorts for the journey! The 2019 itinerary will be published nearer the time, but you can CLICK HERE to see the 2018 itinerary. Price includes accommodation, half board (Breakfast and Evening Meal), Airport transfers to the resort and all Fitness & Yoga activities. Price does not include flights, drinks or lunches. Prices are per person and subject to availability. Room prices are based on 2 guys sharing a room, if you would like a room to yourself you’ll need to pay the single room supplement. There is a £200 deposit required at time of booking. The balance will be due by February 2019. The accommodation at Villas Blancas has been refurbished in 2016 and provides modern spacious villas and suites. The one bedroom villas have a lounge and kitchen area, bedroom, bathroom and private front and rear terraces. Each villa has a flat-screen TV and air-conditioning. These villas can be configured with a double or twin beds. VB2A is a large room with large double bed. VB2B is a small room which can be configured with a double or twin beds. The suites have one bathroom shared between the occupants of 3 rooms, so there could be a maximum of six guys sharing a bathroom. All prices are based on 2 guys sharing a room. If you are not able to share a room you will need to pay the single supplement. If you would like to share a room with another guy you should either create one booking for both of you or, if you wish to pay separately, create two bookings and let me know who you are sharing with in the booking comments. There is now a private Facebook Group for you to chat to other guys, introduce yourselves, and see if anyone wants to share. You can also come along to the Sunday classes, meet other guys and agree to share with someone you get along with. 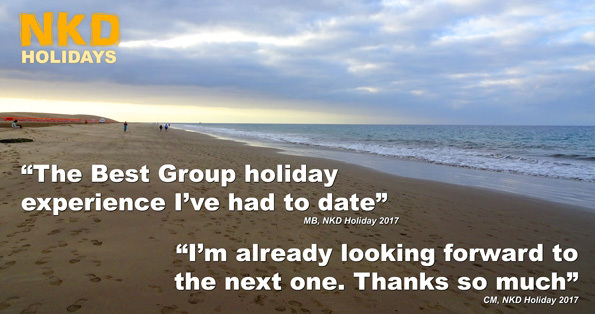 You can also use the Facebook Group to chat to other guys about NKD Holidays and related topics. Set within spacious tropical gardens Villas Blancas offers the very best in exclusively gay accommodation for men on the year-round sunshine island of Gran Canaria. Ideally situated between the busy, popular gay nightlife of the Yumbo Centre and the world famous gay beach and sand dunes of Maspalomas, Villas Blancas offers a tranquil oasis in which to sunbathe and make friends. The two large pools, sun terraces, 14 man jacuzzi and sauna provide the perfect clothing optional setting. All the resort facilities are available to you should you decide to have a break from the fitness activities. The pool, bar and restaurant were fully refurbished in 2018. You will need to book your own flights. Please let us know your flight details, and keep us informed of any changes so we can arrange your transfer to the resort. If you are travelling from London there are several options, including EasyJet, Monarch, Ryanair, Iberia, Norwegian, Thomas Cook and Thomson. When comparing prices please be aware most airlines now charge extra for checked-in luggage and some of the cheaper flights have very late arrival times.